"Fantastic training! 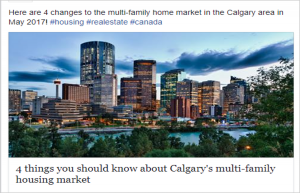 Extremely informative, unlike any other course and I will recommend it to my clients, friends and team members"
Paul Raszewski, Toronto, Broker of Record, Condos and Castles Realty Inc. This live, intensive workshop lays out your marketing plan and calendar, so you're generating quality leads 365 days a year. Increase your online influence and impress local prospects with relevant regional content! Now you can get regional Real Estate and Mortgage posts with your “Done for You” social media service for Mortgage Brokers – at no extra cost. 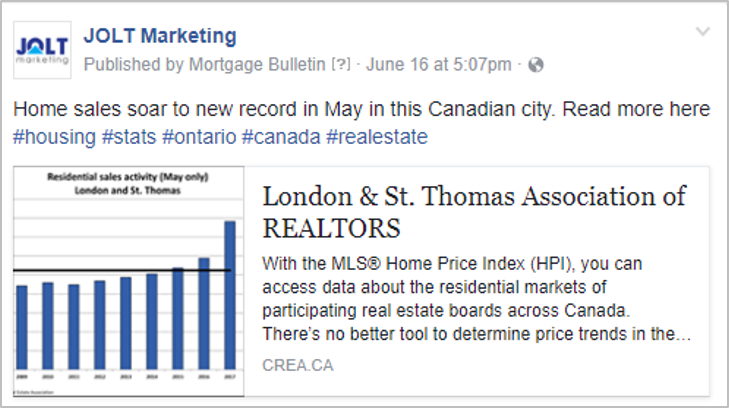 We’ve added a new category for your mortgage broker social media service called “Regional Real Estate and Mortgage Content”, which you can now select as part of your “Done for You” social media service. 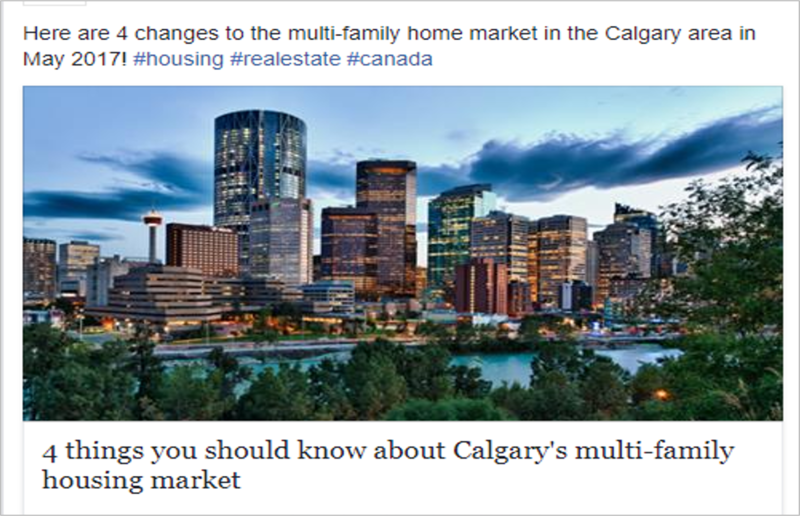 With this category you get timely, educational updates on local real estate trends including home prices and sales activity and regional government changes such as provincial down payment programs or foreign buyers taxes that makes you look like an expert that’s on top of your game! While you’re here, it’s also a great idea to review & update your categories and make sure your content selections still work for you. *This category is FREE for existing clients. If you’re not yet a client and want to get a FREE trial of our “Done for You” Social Media service for Mortgage Brokers, please email info@joltmarketing.com to schedule a demo and free trial. * Linkedin requires you to confirm that you still want us posting for you – every 60 days. When it’s time to confirm permissions, you will automatically receive an email from Mortgage Bulletin saying we can’t post to Linkedin until you confirm the permissions. Please follow the instructions in the email to reconnect your account. * The more people that see your posts the better! Want more people to see your posts? 1. If a post is relevant to someone, tag them in the comment section of your post (to tag someone, start typing their name as a comment and you’ll automatically see a drop down list of people that match the name you are typing). 2. Grow your influence by continually adding friends to your Facebook profile, asking people to like your page, following people on Twitter, and sending invitations to connect on Linkedin. If you’re not sure where to start, ask your recent clients and referral partners first. 3. Like getting Realtor referrals? 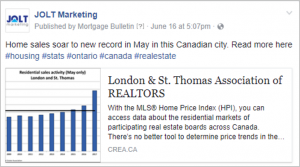 Make it easy for them to remember you, and add value to your relationship by sharing the best listings they post on social media on your own profiles. When you do this, make sure you also tag your Realtor, so they know that you are promoting them! When you call them up a few days later asking for referrals, you’ll get a better response as you started by giving to them first, before you asked for anything! 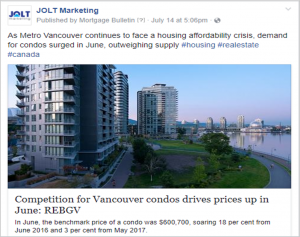 If you’re not yet a client and want to get a FREE trial of our “Done for You” Social Media service for Mortgage Brokers, please email info@joltmarketing.com to schedule a demo and free trial.